Dining rooms come in a variety of shapes and sizes and in some open concept homes you simply have to create your own. Our Miami house doesn’t have a dedicated dining room and that’s possibly the smartest thing that the builder did. the pool is right outside the French doors. In any event, this is it for our “formal” dining space and although open to a large portion of our home it’s tight quarters and we can only fit a maximum of 6 people at this table. So when we have family and friends, we fling open the Frenchies (doors:-) and the spillover of guests can mix and mingle outside. Does it look like you can jump right out into the pool? Slight optical illusion but it’s a tight squeeze there as well. 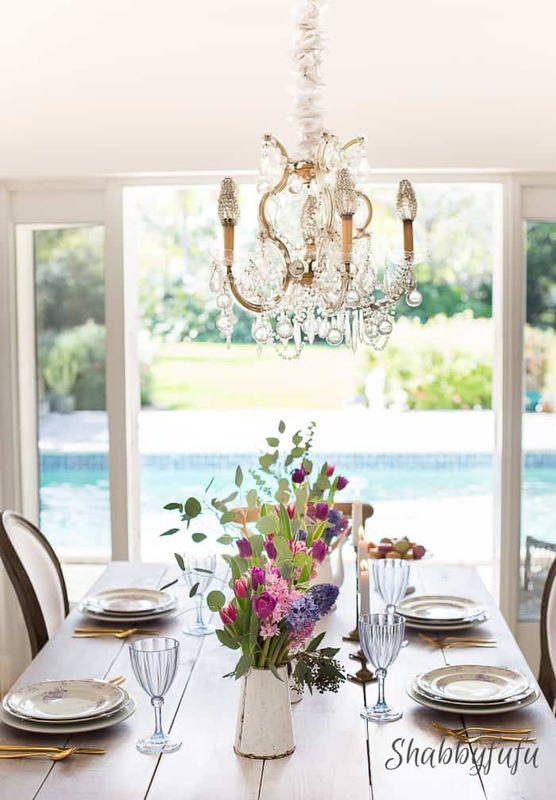 Keeping it clear of furniture directly in front of the glass doors gives the feeling of more space, so if you too have a patio with perhaps a deck right outside…try and place your dining table off to the side if possible. Did I ever tell you that over the years that we’ve lived here several people have actually fallen into the pool? Haha…it’s true, but no one was harmed and it was limited to the kids and their friends chasing each other playing. No worries…I always kept an eye on them. Limited space though brings creative solutions and I’m sharing a few favorite tips with you today. If you are looking for a new dining table first consider your room’s layout and size and how many people you normally seat. Do you entertain, or is your table going to be for family dinners? 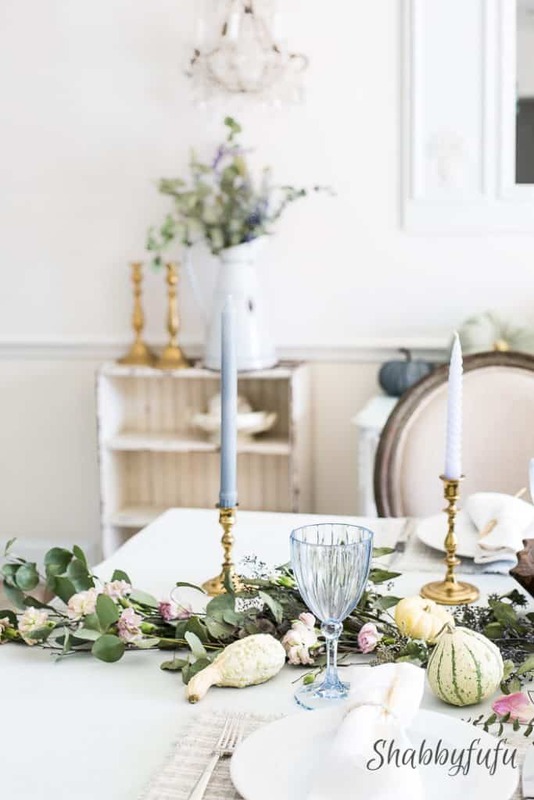 I find that round tables can work best for small or square spaces while rectangular tables work well in large rooms and like mine…rooms that are narrow. The table below is in the breakfast nook at the beach place and is a VINTAGE CARD TABLE that I refurbished and matched up with some petite vintage French chairs. 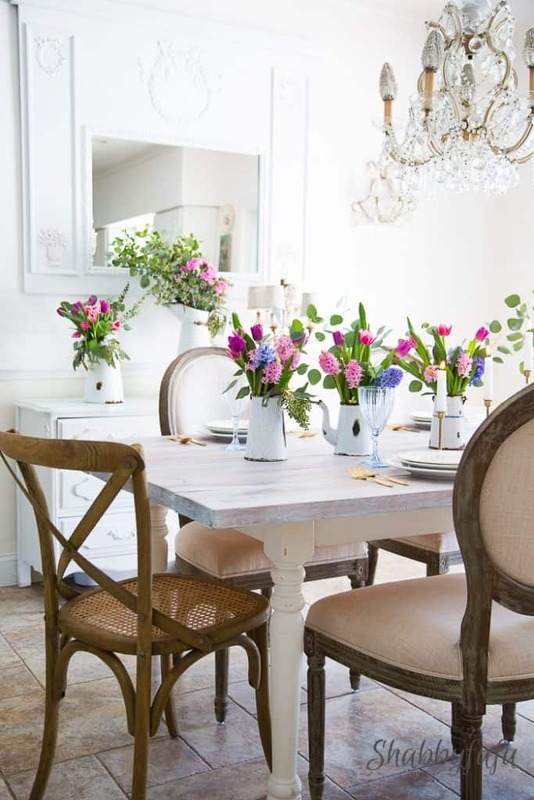 Consider not only the size of your table, but try and find chairs that are in scale with the table when doing a mismatched look. Personally I always love mismatched and not sets because I feel that it gives a room more character. Size is important and number one is space planning and don’t forget that if you are mixing and matching that you’ll need to choose chairs that will fit comfortably around the table and with leg room! Allow each guest a minimum of 24″ of table surface and more if possible. Consider the traffic flow of your home and don’t allow your table to disrupt pathways when possible, keeping them open to walk around. Don’t like to measure? Just be sure that there is adequate room and choose chairs accordingly if wall space is behind your table. 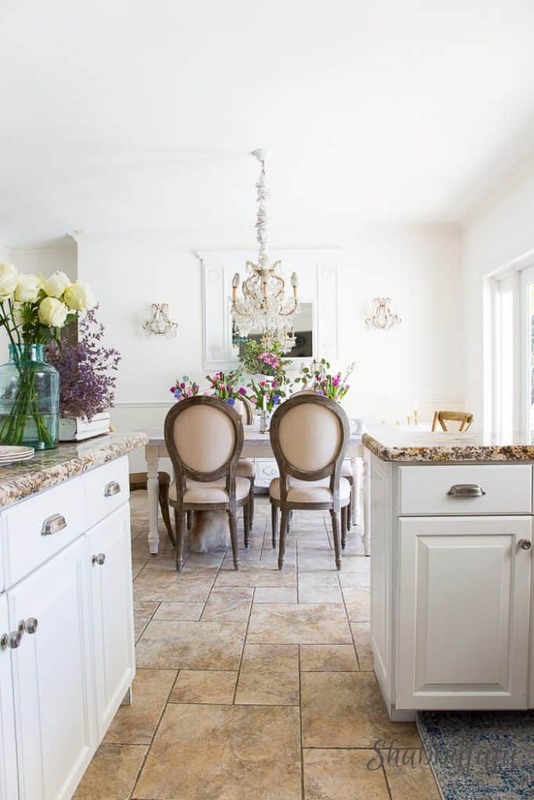 If you are planning on adding a buffet or china cabinet to the room consider placing it in a corner or at an angle. I live in Charlotte and we go to church with your brother and Margie! She gave me your site because we are remodeling our kitchen and I was looking for ideas! I have loved following your ideas and your beach house turned out great! I am looking for handles for our new white kitchen cabinets, can you give me your advise!! I am using brass as my main metal on Chandeliers, floor vents, light switches etc. I love a more formal glass and brass shinny look! We settled on Quartz Caeserstone Frosty Carrina for our working space countertops. The island will be Leathered Taj Mahal and dark stained base to match the dark wooden floors.. The cabinets will be painted BM simply white, so here is my question…..we are doing all cabinet front appliances except the Ovens have stainless steel handles, so what type of metal finish should I put on the handles on the white cabinets. I want to do brass but it will not match the ovens will that look off? That would put the brass handle on the refrigerator right next to the stainless steel ovens handles! Thanks for any input you can give me, I really appreciate your help! Hi Nancy, nice to e-meet you via Margie 😉 I would use brass if that’s what you love and not worry about matchy-matchy or clashing. My handles are a slightly darker finish than the typical lower end handles one might find at the home improvement stores. Mine are the Lugarno aged brass pulls from Restoration Hardware. Good luck!